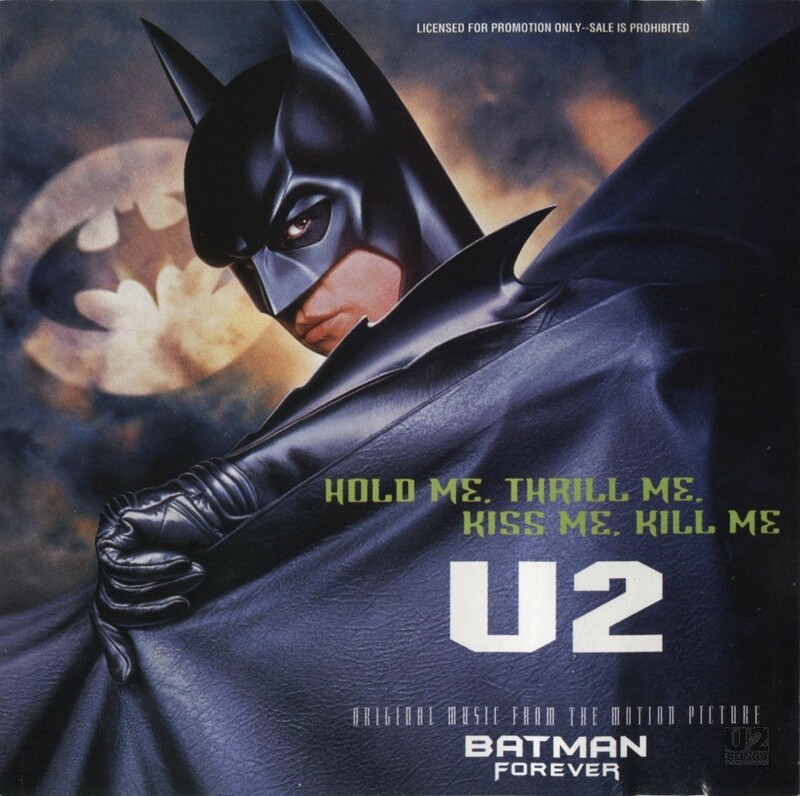 “Hold Me, Thrill Me, Kiss Me, Kill Me” was the lead single used to promote the movie “Batman Forever”. It was the first song on the soundtrack. The soundtrack featured a version that was 4:46 in length. The single itself, both the commercial and promotional single, featured a version that was labeled “Single Version” which was also 4:46 in length and there is little difference to be heard. Some promotional versions also included a shorter version of the song at 4:33, which is labeled as an “Edit”. Two different 7-inch singles were pressed for promotion and used in juke box machines. Both of these were in black vinyl, and featured an injection molded label rather than the more traditional paper label. These were produced in France, for use throughout Europe and the UK. The juke box single featured the “Single Version” on the A-side, and featured “Themes from Batman Forever” by Eliot Goldenthal as the B-side. On one version, this was actual labeled as a U2 track on the vinyl label. A 5-inch CD was pressed and released in Germany by Atlantic Records (in conjunction with Island). The CD was distributed in a slimline jewel case which featured the cover image as used on the single, but the interior insert was white with black text. This version of the promo single contained the “Radio Edit” and the “Single Version”. There were also two 5-inch CD singles pressed for promotion in the USA. The first featured just one track, the “Edit” of “Hold Me, Thrill Me, Kiss Me, Kill Me”. It was released in a full jewel case with front and back inserts. The second 5-inch CD single released for promotion featured both the “Edit” and the “Single Version”. This too was released in a regular jewel case, but only included a quickly done back insert in white with black text. There was no front cover, instead text information about the track was printed onto a green sticker which was applied to the front of the jewel case. This was the second promotional single released.